Troubled by eye infections, Pissarro visited a doctor in Paris in 1893 and was advised to avoid dust, wind, and bright sunlight, since they might further irritate his eyes. Forced to work indoors, he took advantage of the views available from the windows of his apartment, which gave him a spectacular perspective onto the streets below. In the following decade Pissarro returned to Paris on several occasions, usually in the winter months, to paint cityscapes from various apartment windows around the city. 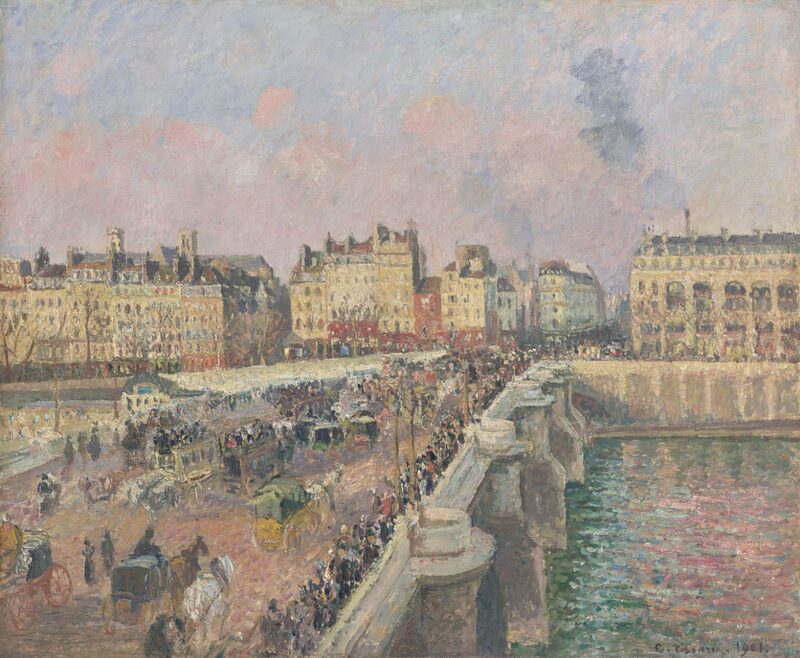 In November 1900 he rented rooms on the Île de la Cité, from which he painted several views of the busy Pont Neuf. The massive bridge slices diagonally across this composition, carrying people, carriages, and wagons to and from the department stores of the Right Bank and the older, largely residential areas of the unseen Île de la Cité. The crowded pedestrian footpath lining the bridge is a jumble of disjointed strokes of paint that form no coherent or distinguishable figures but rather a colorful, moving mass. The restless energy and dynamism of the city was an appealing subject for the Impressionists and especially for Pissarro, whose city views celebrate urban life, architecture, and commerce. Jennifer A. Thompson, from Masterpieces from the Philadelphia Museum of Art: Impressionism and Modern Art (2007), p. 64. Purchased from the artist by Durand-Ruel, Paris, May 17, 1901, until 1914 ; sold to Conrad M. Pineus, Göteborg, Sweden, July 6, 1914, until at least 1917. With Wildenstein & Co., New York and Paris [with Bernheim-Jeune, Paris? ]; sold to Georges (Lévy) Lurcy (1891-1953), Paris and New York, probably by 1940 and certainly by 1944 ; sale, Georges Lurcy collection, Parke-Bernet, New York, November 7, 1957, no. 22; purchased by Charlotte Dorrance Wright (1911-1977) and William Coxe Wright (d. 1970), St. Davids, PA, through E. J. Rousuck, New York (dealer), as agent, until Mr. Wright's death in 1970 ; Charlotte Dorrance Wright; bequest to PMA, 1978. 1. Joachim Pissarro and Claire Durand-Ruel Snollaerts, Pissarro: Critical Catalogue of Paintings, Milan and Paris, 2005, vol. 3, no. 1351. The painting was published in 1939 by Venturi and Pissarro (Camille Pissarro, son art -- son oeuvre, Paris, 1939, no. 1181) with a photo credit to Durand-Ruel, but without a current owner listed. 2. The 1957 Parke-Bernet catalogue lists Bernheim-Jeune, Paris as selling the painting to Lurcy, and the exhibition at Knoedler Galleries, New York, "A Collector's Exhibition", February 6-25, 1950, also gives the Bernheim provenance; however, according to Pissarro and Snollaerts, Wildenstein were the sellers. Lent by Lurcy to New York, Carroll Carstairs Galleries, "Paintings of Paris by Camille Pissarro," April 12-26, 1944, no. 2. He probably acquired the painting before 1940: according to Towner, The Elegant Auctioneers (New York, 1970, p. 578-589), Georges Lévy formed his art collection before he emigrated to the US in 1939-40 at the outset of WWII to escape Nazi persecution. At this time he changed his name from Lévy to Lurcy. 3. Information cited by Towner, The Elegant Auctioneers, 1970, p. 588. E. J. (Emanuel Jay) Rousuck (also spelled "Roussuck") of Wildenstein & Co., New York, advised the Wrights on their collection; see PMA, The Charlotte Dorrance Wright Collection, 1978, p. 7.